Description: The sky was getting darker as this photo was taken, but the former Conrail engine is still pretty focused and that's what counts! Description: A solid set of Conrail power leads NS 18G past the waterworks. Description: NS 8363, still wearing its Conrail Quality paint, trails a horse head D9-40CW unit with an eastbound stack train. Description: 20G passes under the Rt. 271 bridge heading east. Description: 20G passes under the signal bridge in Derry heading east on 1, an approaching westbound has a clear on 2. Description: Fall colors are very much in evidence as 24V heads east over the Lehigh Line. Description: Ex Conrail C40-8W leads NS slab train 69N eastbound on track 2 at Swedesburg PA near milepost 17 Harrisburg Line. Description: An ex-Conrail unit leads an empty coal train up the hill and around the curve at MP417 on the NS Chicago district. Description: Westbound 19G departs the yard with a former Conrail unit on the point. Description: NS 8363 went up the Omaha line as the Train on Main 2 was waiting to go to Sioux City. At the same time there where three Eastbounds just on the west side Oreapolis waiting to go east. Description: A MOW Vehicle meets an Eastbound Manifest led by a Dash 9, a Dash 8 (Ex. 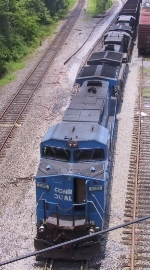 Conrail), a high-hood GP40, and 2 slugs. Description: The daily NS movement eases into the yard with an ex Conrail trailing. Description: NS mixed freight 36G heading eastbound through South Plainfield, NJ. Description: Westbound on track one with a still blue ex-Con trailing. Description: Behind the VFW, 0742 hours. Description: The "normal" edition of NS empty autorack train 11J zips westbound by the eastbound signals at West Laurel. I absolutely hate this time of year with all the heat distortion evident. Description: Inbound NS 20T at the Wabash - Illinois Central diamonds.